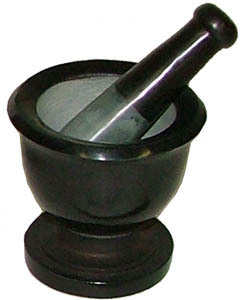 A mortar & pestle is used to grind together herbs and incense resins. The stick-shaped pestle crushes the ingredients in the bowl. Many people use it to create magical blends for spells. Made of carved soapstone. Size: 3″ tall, 3″ wide.